As a longtime resident of Rome, carbonara is one of my very favorite pastas, but in the warmer weather it can be a bit heavy. One way to lighten things up is to make a vegetarian carbonara: substitute the pancetta (Italian bacon) with a vegetable, typically zucchini, which has a natural affinity for eggs, as we’ve seen before in our posts on zucchine cacio e uova and zucchini frittata. 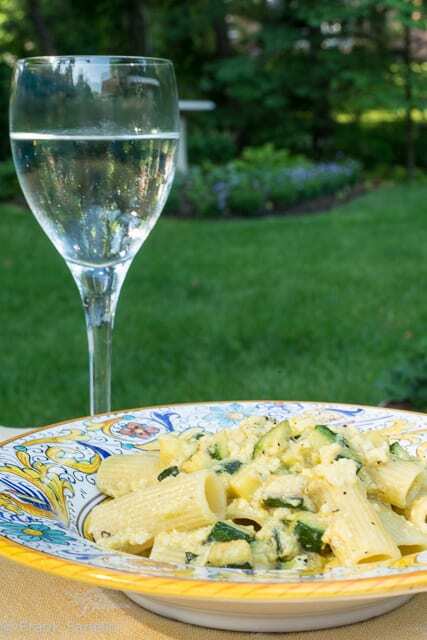 You proceed almost exactly like a classic carbonara; the only difference is you add a bit of garlic or onion to sauté along with the zucchini to add a bit of savor. While not exactly dietetic, the result is delicate but full of flavor. Cook the pasta in abundantly salted water until al dente. Separately, in a skillet, sauté the garlic until it is just slightly brown. (If using onion, let it sauté very gently until it is perfectly soft and translucent, without browning.) Then add the zucchini and continue over moderate heat, seasoning with a pinch of salt, until the zucchini is cooked and just lightly browned. If you’re using young, tender zucchini, this should take 5 minutes or less. Once the pasta is cooked al dente, drain them (but not too well) and pour them into the skillet over very low heat. Make sure there is a bit of pasta water clinging to the pasta; if not, add a ladleful from the pasta pot. Mix well and then add your egg mixture and mix again. Keep mixing until the eggs just being to thicken and form a creamy sauce that clings to the pasta. If you prefer (and these days I tend to like my carbonara this way) or if you are worried about contamination, you can continue a bit longer until the eggs actually set. In either case, remove from the heat as soon as it just bit less done than you want, as the eggs will continue to cook from the residual heat of the pasta. Serve your vegetarian carbonara immediately in warm pasta plates, with additional pecorino and ground pepper for those who want some. The ‘baby’ zucchini you can find in some fancy markets works particularly well in this dish, but isn’t a must. But do look for the youngest, smallest zucchini you can find. Zucchini tend to become a bit fibrous and less flavorful as they grew older and larger. And avoid zucchini with blemished skin—that’s a sure sign they’ve been sitting around too long. The zucchini can be sliced crosswise into rounds, but I rather like cutting them into cubes to imitate the look of pancetta—a kind of inside joke. Carbonara is typically made with spaghetti but, as we explained in our post on the classic version, it lends itself well to a variety of ‘stubby’ pastas like rigatoni and penne, too. My our mind, that’s particularly true of this vegetarian carbonara. Separately, in a skillet, sauté the garlic until it is just slightly brown. (If using onion, let it sauté very gently until it is perfectly soft and translucent, without browning.) Then add the zucchini and continue over moderate heat, seasoning with a pinch of salt, until the zucchini is cooked and just lightly browned. If you're using young, tender zucchini, this should take 5 minutes or less. Serve immediately in warm pasta plates, with additional pecorino and ground pepper for those who want some. Now I know what we’re having for lunch tomorrow! Thanks for another great recipe. And thank you for stopping by, Tina! What a beautiful summer recipe Frank! Fresh, small, tender zucchini are now available here, and we really can’t wait to try this recipe out! :) You’re so right: the eggs and zucchini work so well together; one of our favorite summer “fast foods” is an omelette with grated or cubed zucchini and lots of kefalotyri (which is similar to Pecorino). That omelette sounds like a real treat, much like the frittata. My vegetarian daughter who includes hard cheese in her diet will absolutely adore this! I am forwarding the recipe to La Levitt immediately. Hope she likes it… ! This sounds lovely, Frank. I made something similar the other night with asparagus… I must try the zucchini version. Asparagus sounds very nice, too, David. This is a wonderful recipe for a warm summer day. I have some baby zucchinis in my garden. I really enjoyed your vegetarian sauce from your last post. It may be a “cheat” but it’s still a wonderful summer pasta to enjoy! Looking forward to my zucchini crop giving us the Romanesco zucchini we love so much and is so good in this pasta! Romanesco zucchini would be wonderful in this dish. Now if we could only find it around here! I like the idea of zucchini, a lot. I include zucchini in some Alfredo-type pasta dishes, but it never even thought of doing it in a Carbonara dish. Inspired stuff — thanks. Thanks for the comment, John. If you try it, let me know what you think. Frank, I look forward to trying this recipe. Just a small point: you still mention “pancetta” in Directions # 2. Since it is vegetarian, I am sure you meant to remove this. :-). Oops! Thanks for the catch, reference removed. This recipe is not vegetarian as parmesan cheese is, by definition, not vegetarian. You would have to replace with a cheese that uses non-animal rennet. Any reason not to seperate the egg whites from yolks, adding the whites with the cheese, then plating the pasta and placing the yolk on each plate atop a little nest of pasta to be broken by the person right before eating? Can’t say I’ve tried carbonara, with or without meat, made in that way, although I know it’s very much in vogue these days. This was so delicious! I used both onion and garlic, a LOT of garlic as I love it so much. Between these flavor and the caramalization of the baby zucchini, I never even noticed the lack of the pancetta. Thanks for sharing! And thank you for your comment, Jeff! Glad you liked the dish. Love the zucchini version almost as much as the original! Pasta in the summer, to us, is mostly in cold salads. This is indeed a much lighter version and I like especially the use of zucchini. We enjoy squash at least once a week in some form or fashion. Summer squash are great just about any way you make them, Drick! With the heatwave we are experiencing in Milan right now, this lighter carbonara is perfect! You make it sound so easy to do. I need to try this at home. Please do and let us know what you think, Laura! hai ragione, questa versione è più adatta alla stagione calda. Faccio anche io una carbonara vegetariana, uso piselli, carote, asparagi e zucchine, buona settimana Frank ! Chiara, that sounds delicious. Like a primavera. This looks so rich and delicious like so many of your wonderful recipes! I love seeing your recipes because they remind me of growing up in an Italian home with my two loving parents and three sisters. Thank you for sharing!